Dr. Brian Sheppard attended the University of the Pacific School of Dentistry, graduating with his DDS in 2010. Brian completed an Advanced Education in General Dentistry Residency in Juneau, Alaska. In November of 2011 he started working with his family and purchased the practice in 2015. The Sheppards have been practicing the art of dentistry in Half Moon Bay since 1978. They raised their children here, as have most of the staff. Dr. Brian Sheppard bought the practice in 2015, starting the second generation of dental care in Half Moon Bay. The Coastside community has always been one the Sheppards cared about, and one that they love taking care of. New families are always welcome. Whether they want to maintain their oral health, dental implants or artisan esthetic work, they can expect a relaxed, caring environment. At Sheppard Family Dentistry we believe that the more a patient knows about their health, the more confident they will be in making decisions about their mouth. We use advanced technologies with top of the line intra oral cameras and digital radiographs. You can see all the information we are using to diagnose and maintain your oral health. We take the time to discuss all treatment options with you. We always strive to enable our patients to achieve healthy mouths. In addition to regular cleanings, our office uses state of the art equipment including lasers, adhesion dentistry, and 1 day CEREC crowns. Bonded CEREC Crowns offer many advantages. Healthy tooth structure is preserved. CEREC cameras allow us to take impressions without goopy materials. A computer controlled milling machine fabricates the restoration during the appointment. The patient no longer requires a temporary, and leaves the office with a restored tooth. No need for a second appointment! 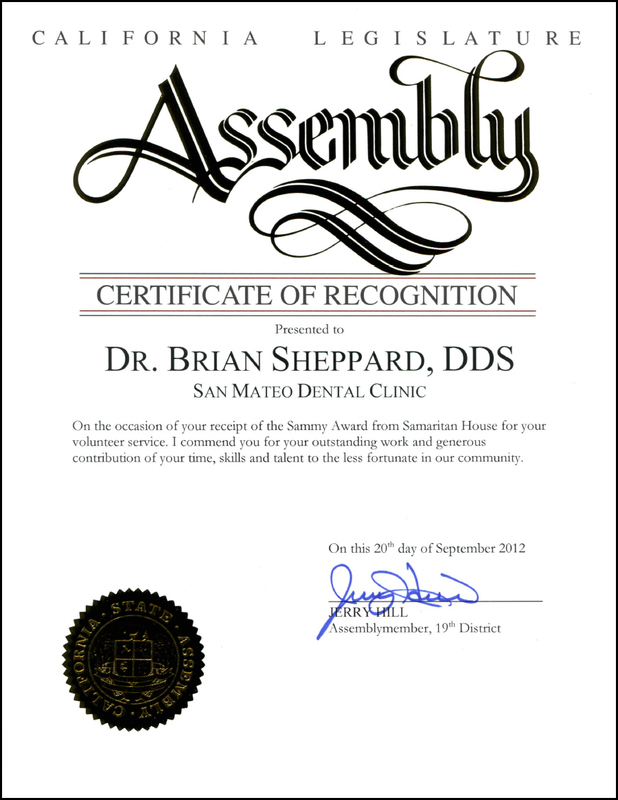 Dr. Brian Sheppard graduated from San Jose State University with his Bachelors of Science in Mechanical Engineering. He attended the University of the Pacific School of Dentistry, graduating with his DDS in 2010. Brian completed an Advanced Education in General Dentistry Residency in Juneau, Alaska. In November of 2011 he started working with his family and purchased the practice in 2015. He is an officer in the United States Army and was an adjunct professor at the University of the Pacific School of Dentistry. Dr. Brian stays busy volunteering his time at various events and clinics such as Veteran Stand Down, and Samaritan House. Dr. Brian Sheppard is constantly volunteering his time to various dental organizations, veteran groups and community organizations. He has been given various awards and letters from different groups as well as local, state, and U.S. representatives. Member of the California and American Dental Associations.